Dropbox today released a nifty little update for its App which now lets you share a link to any doc, photo, folder or to any of files online. As per the Dropbox blog to start off, Dropbox users will have to first right-click on to the content the user wants to share, and select "Share Dropbox Link". Soon after like shown in the image above, a tiny bubble will appear telling the user that the shared link is in their clipboard. Alternatively, users can press Control-v or Command-v to paste their link to get going. Looks like Dropbox can't put a foot wrong as of now regarding user experience. The update also offers a new look with large buttons and a clean interface. The update even brings about thumbnails of files that you have shared or just uploaded, making it easy for you to spot and revise them. The only problem as of now is that it is a little difficult to find out how much space you still have left and seeing the “pause sync” option is a bit of a task that requires a couple of more clicks. 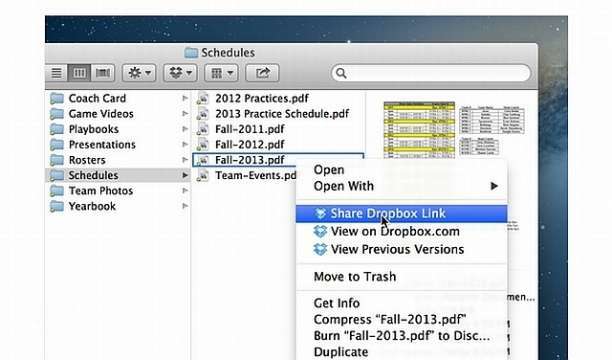 If you have large files to share head over to Dropbox, sign in and download the App for your PC.